Greenhouse Augustenborg in Malmö, Sweden, is a showcase construction and refurbishment project within sustainable city development, and an integral step in the greening of the Augustenborg area itself. 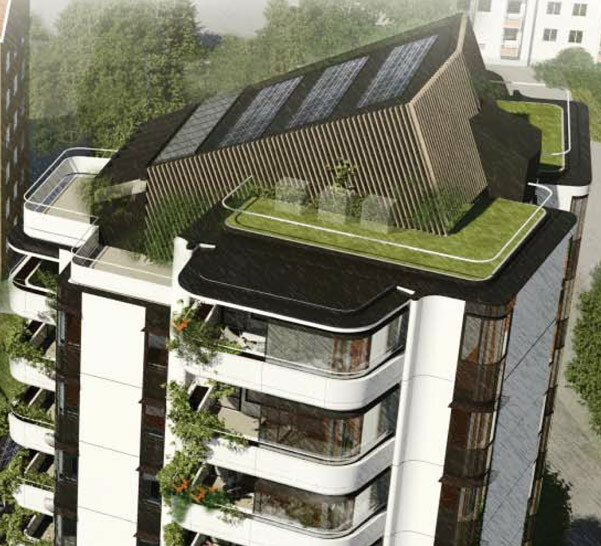 The holistic approach to the design aims to reduce the residents’ ecological footprint. The building is, for example, equipped with greenhouses on the roof and large balconies with special cultivation areas. The building contains 56 apartments in total. The project was realised by NCC. Greenhouse Augustenborg’s objective has been to develop sustainable housing, to promote housing that is innovative in terms of energy use, make use of various environmental techniques, relate to tenants’ life styles, and support social cohesion. Greenhouse Augustenborg is a project with a particular historical context. Augustenborg, a neighbourhood of Malmö, is an area that was built in the early 1950’s, during Sweden’s post-war prosperity. At that time, it had its own coal-fueled central heating power plant. The area was designed in line with the Swedish standards and philosophy common in the 1950’s – including an overall layout designed to ensure optimal conditions for sunlight. Construction started in 1948 by the housing company MKB. The underlying idea was that Augustenborg should not only consist of apartments, but also have schools, shops, work places and community centres. Later, however, the area entered a slow decline, but was then revitalized in 1998 by a government-funded program. Currently Augustenborg represents a leading example of an eco-city. The process of developing the Green Augustenborg project – or Ekostaden Augustenborg in Swedish – started in 1997, and in 1998 the main targets were set together with local inhabitants. These were to: 1) Reduce the effects of flooding (an open storm water system); 2) Actively engage the local community in the improvement work; 3) Lower energy consumption, closely tied to the desire to lower the cost of living; 4) Introduce green roofs; and 5) Introduce a musical-themed playground. 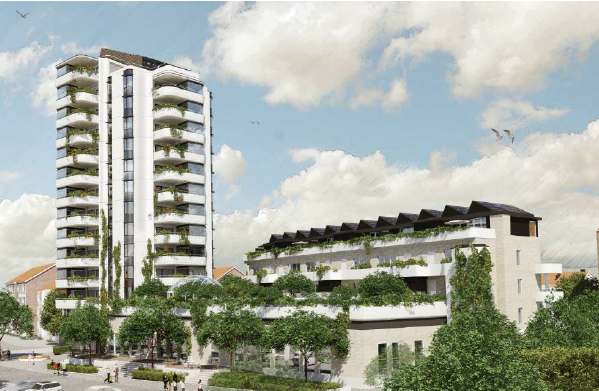 A main principle was that the residents should not move away, i.e., that the area should not undergo a transformation on the expense of changing the resident mix. The results from these actions, initiated in the late 1990’s, have had positive effects on the neighbourhood, and the area has also reached a higher degree of climate resilience in managing heavy rainfall through the open storm water system. The philosophy behind Greenhouse Augustenborg has been to add new urban space and qualities to the already existing neighbourhood, continuing to build on the actions and efforts already carried out. 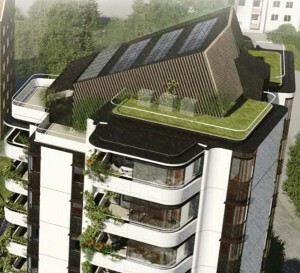 The project’s key sustainable principles have been to focus on resource conservation, and create a climate smart building, which contributes to lower energy consumption and a healthy indoor climate, as well as engages users in the actual design and upkeep of the property. The new part of the building is 14 storeys high and the refurbished part is 5 storeys high. The building houses 56 apartments in total. As the focus was on building a community, the building contains common areas, such as a rooftop greenhouse, available to all for growing light intensive plants and keeping other plants during winter. The rooftop also has a terrace for common use. The project also approached how to influence behaviour by making use of smart technology. Each apartment is equipped with a wall mounted reading pane, giving data on energy, water and sun-produced electricity consumption, as well as other data, such as where bikes may be rented. The reading pane also, for example, facilitates turning off all appliances when leaving home. The owner of the building has also launched an educational and awareness effort. In this, the residents have received information on how to think smart in terms of energy efficiency, and for example on how to grow plants or food ecologically, and how to cook sustainably. A key dilemma often faced in architecture is the zone that separates the outdoors from the indoors, and how this can be bridged. Each apartment is equipped with a 21 sqm balcony, which is half open and half covered, thus creating unique outdoor/indoor spaces. In addition, towards the outside each balcony holds a planting area, measuring approximately 0,5 x 0,5 x 10-12 m. This means inhabitants have opportunities for urban gardening that are rarely available in the Nordic countries. Each apartment is also equipped with its own elevator door. This makes it possible to actually transport for example soil in a wheel barrow, all the way from the basement to the balcony. In the building phase, transparency was put into practical action, via the idea of partnering. This means an open common budget with alignment of interests through profit/loss sharing within agreed rules. The partnering approach enabled everyone involved to understand the overall business case, and to take into account each other’s points of view. It should be noted that this meant that everyone – including the future owner, the main contractor, and the suppliers – shared the same office during the project. Sharing an office meant that information was shared more quickly, and that decision making became more efficient. The project indicates that to achieve success, all parties need to buy-in and collaborate: There is more to developing an area than building an individual house. The building, a rental property completed in 2016, was rated Gold according to the Swedish Green Building Council rating system. Throughout the design phase, cooperation and collaboration between the client, the architect and the builder, resulted in novel solutions. This was, in particular, the case in relation to how individual residents can a have a sustainability impact on and through their daily lives. Awareness is raised and sustainability impacts are communicated through tailored infographics. The unique approach in bringing the natural environment close in an urban setting also provides an opportunity for a more balanced life with lower stress. – In order to facilitate biking, the building has a bicycle garage with bike wagons, that are free to borrow, for example, for doing weekly shopping. 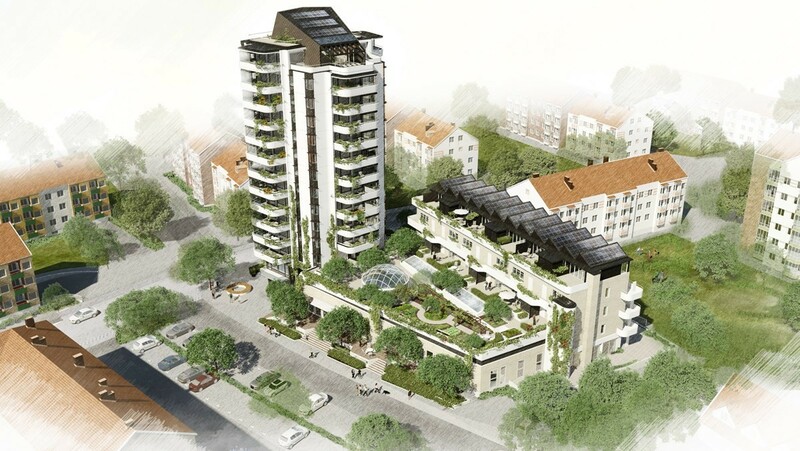 The project is a very good example of both area and property development, as well as the value added of close cooperation between different stakeholders. Greenhouses Augustenborg should be seen in a progression of a process that started about 20 years earlier, in the City of Malmö’s desire to raise the overall quality of live in Augustenborg as a whole. Posted in Architecture Marbella Costa del Sol News and tagged with sweden living healthy green house roof holistic balconies housing consumption project enviroment energy Sustainable architecture news .